With our excellent up-to-the-minute deals, superb quality line-up of hotels and resorts, and commitment for value-for-money, Travelbag is certain to have something to meet every budget, requirement and preference in Australia. 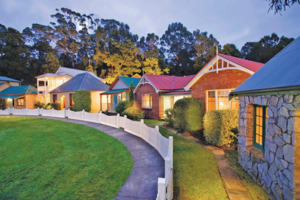 Here is just a selection of our favourite and cheapest hotels in Tasmania. Please use our search panel above to find your perfect choice. 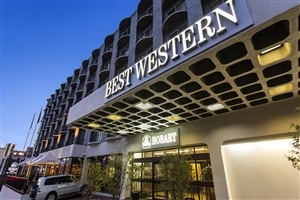 Located in the heart of Hobart city centre a short distance from the main shopping mall, the Best Western Hobart is a comfortable, stylish holiday destination aimed at providing a great level of service in a distinct setting where easy access to the city’s highlights is accompanied by a spacious, ... elegantly designed hub for both business and leisure travellers to enjoy. 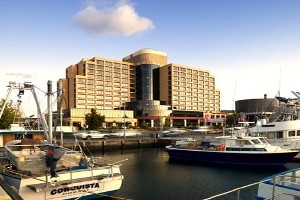 The avid explorer will find such landmarks as Battery Point, the Hobart Waterfront and Salamanca Place a treat to discover, while the hotel itself ensures a good time with its many facilities on offer, its sumptuous dining venue and bar lounge, along with each of the 140 fully fitted guestrooms and suites that together make this a memorable Australian getaway. Situated on the fringe of the magnificent Cradle Mountain at Lake St Clair National Park, the Cradle Mountain Lodge basks amidst the glorious setting and stunning scenery that stretches across the Tasmanian landscape, making it a holiday haven that brings travellers close to all the natural beauty one could hope ... for. The hotel welcomes travellers the world over with a warm, attentive level of service that coincides with the intimate, discreet setting, presenting a wealth of comfort and privacy unmatched by many other holiday establishments, an idyllic haven of splendour for all to enjoy. 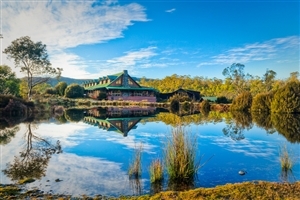 With a range of soothing facilities, an exquisite dining venue and a number of heavenly cabins to choose from, this hotel is simply perfect for romantic couples to escape in, families to enjoy adventures from and business travellers to find their muse during their memorable Australian stay. 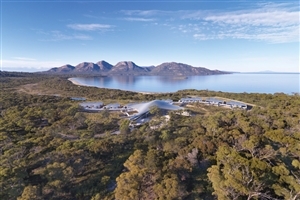 Situated along the eastern coast of Tasmania, the eco-friendly Freycinet Lodge enjoys a magnificent position looking out over the natural hues that adorn the gorgeous island, from the azure waters of the Great Oyster Bay to the deep greens of The Hazards range that stretches across the landscape, creating an ... oasis of beauty for all to appreciate. All the sights and sounds of Freycinet Peninsula await each and every guest to the lodge, with the white sands mere feet away and such highlights as regional wineries, fruit growers and seafood producers all waiting to be uncovered by the avid explorer. The lodge itself presents a world of comfort and style unlike any other, with each of the timber designed accommodations serving as sanctuaries amongst the verdant foliage, combining modern elegance with natural splendour for an unforgettable combination in one of Australia’s most beautiful settings. 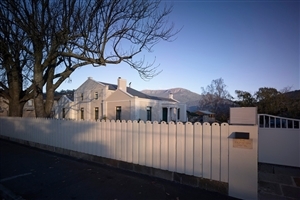 Holding up the traditions and elegance of a time long past, the Henry Jones Art Hotel stands as a charming holiday haven whose culture extends from its distinct facade to every corner of its foundations, blending old-world heritage with contemporary comforts and styles to create a best-of-both-worlds setting that even ... the most well-travelled are sure to find a breath of fresh air. 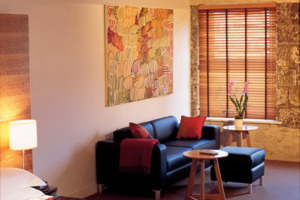 Situated alongside the Hobart waterfront, the hotel provides plenty of exploration opportunities for guests who like to immerse themselves in the bustling ambiance of a city, from the dining venues and entertainment outlets to the local landmarks and scenic hotspots that make the capital city of Tasmania as renowned as it is. The hotel itself hosts plenty of fine facilities to choose from, a number of in-housing eateries and 56 beautifully designed guestrooms and suites that each serve as idyllic havens of peace and privacy for business and leisure travellers looking to experience the best of Australia. Located with prime views that overlook the waterfront of Tasmania’s island capital of Hobart, the Hotel Grand Chancellor is a fantastic Australian hotel that brings an abundance of comfort and convenience of those seeking something special in the great “Downunder”. Mere minutes from such city highlights as Battery Point, Salamanca ... and the central business district, the hotel proves to be a magnificent hub from which travellers can start and end each day and experience the vibrancy of such a bustling city setting. Hosting plenty of fine quality facilities to choose from, an exquisite dining venue and 244 lavishly designed accommodations that grant peace and serenity to the most discerning of guests, the hotel is perfect for that unforgettable holiday we all strive for. Situated deep amongst the wondrous scenes of the capital city of Tasmania, the Islington Hotel is a perfect getaway for business and leisure travellers looking to experience the many sights and sounds of Hobart and all it has to offer. The hotel itself is quite small, granting a sense of ... intimacy to the warm and welcoming setting to coincide with its lavish furnishings, private spaces and gorgeous vistas that stretch from the hotel gardens and courtyards all the way to the mountains in the distance. Adorned in plush comforts, stylish artwork and traditional furnishings, the hotel strives to bring peace and serenity to holiday-goers in order for them to experience what is sure to be a memorable Australian vacation. 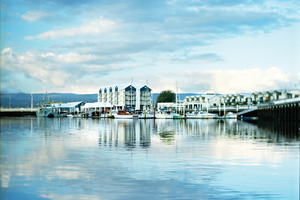 Located at the convergence of the North and South Esk River in Tasmania’s Launceston region, the Peppers Seaport Hotel is a magnificent Australian holiday escape that delivers a memorable experience for any and all travellers looking to indulge in the sights and sounds of the second largest city of Tasmania. ... A short distance from the vibrancy of the town centre, the hotel presents travellers with the opportunity to discover the surrounding splendour on treks and scenic walks to discover the culture of the surrounding area. The hotel is adorned in stylish tones and is uniquely designed in the shape of a ship giving it a sense of charm that is unattained by other holiday establishments, and when combined with the in-house dining venues, the high quality facilities and each of the 60 guestrooms and suites that serve as private havens, this Australian getaway is sure to impress even the most discerning of guests. 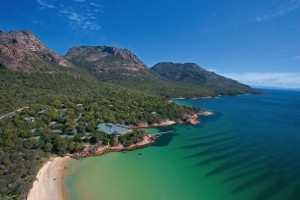 Located along Tasmania’s gorgeous East Coast, the Saffire Freycinet rests in one of the most beautiful regions on the entire island; Coles Bay, an area where sweeping swaths of green compliment the rugged mountains that ebb over the horizon, connected by leagues of serene, cerulean water, for every guest to ... marvel over. Striving to present guests the world over with enough lavish comfort, space and privacy to make other holidays pale in comparison, the hotel serves as a haven like no other, sporting some of the finest modern luxuries in Australia to ensure satisfaction to the most discerning of travellers. Whether it’s exploring the untouched landscape, experiencing unique moments with loved ones or simple easing back into a state of bliss, the hotel aims to please, and with so many facilities, dining opportunities and elegantly adorned suites to choose from, business and leisure travellers alike are never going to want to leave. Set along the west coast of Tasmania, Strahan Village is a fantastic hotel that consists of elegantly designed guestrooms and charming cottages that are custom made to enhance the holiday experience of business and leisure travellers looking to get to grips with the beauty and splendour of this magnificent Australian ... island. Looking out over the serene waters of Macquarie Harbour, the hotel presents an opportunity for the avid explorer to uncover the sights and sounds of Strahan, an idyllic setting that serves as the gateway to the Franklin–Gordon Wild Rivers National Park and the Tasmanian Wilderness World Heritage Area as well as reaching out to the fishing port, offering an abundance of vistas and scenic hotspots for people to enjoy. Consisting of an Esplanade section and a Hilltop section, the hotel provides a warm, attentive level of service for any and all guests with its in-house dining venues and quality facilities that come together to create a haven of true bliss.